The V&A Illustration Awards are delighted to support Pictures Mean Business and their campaign to promote the benefits of crediting illustrators for their work. Duly crediting work plays an important role in improving the visibility of an illustrator’s practice, increasing sales of a publication and enlightening readers keen to find out more. Since 1972, the Awards have been held annually to champion the UK creative industries and celebrate the ingenuity and imagination of illustrators, offering free entry and top prizes. Our Published Awards recognise the remarkable accomplishments of professionals whilst our Student Awards aim to inspire the next generation. – Martin Flynn, V&A Illustration Awards Manager. 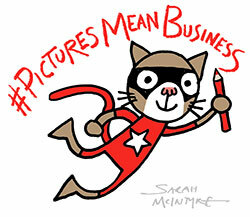 The #picturesmeanbusiness team are so happy to have the support of these prestigous awards, it it truly great that an established institution, already committed to highlighting the outstanding work of illustrators, is willing to back a campaign that is beneficial to the illustration industry. The winning artwork and student shortlist will be displayed at the Museum next year. Each winner will receive £3,000, with the overall winner awarded £8,000. The National Art Library also acquires winning work and duly credits the illustrator in in the catalogue record. See our list of supporters here.